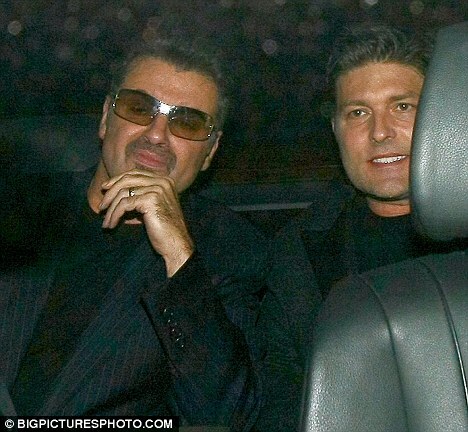 "George Michael and his long-term partner Kenny Goss put on a united front in London last night. Two weeks after the gay couple were reported to have split, the pair showed they were still very much an item after 13 years together. The former Wham! singer, 46, and the Texan gallery owner, 50, showed off their commitment rings as they enjoyed a romantic meal at Nobu Berkeley in Mayfair. The couple were celebrating Goss's return to London after he spent months working in his native US at his gallery. Leaving the Japanese eaterie last night, the pair were wearing gold bands on their wedding fingers, a symbol of their commitment to each other. The pair have worn the rings for many years, but are yet to wed in a civil partnership ceremony. 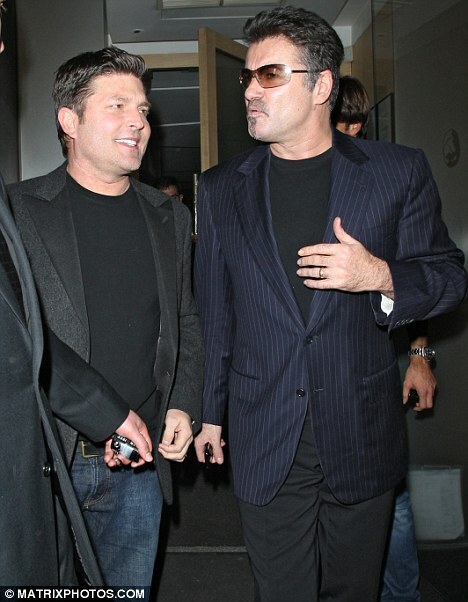 Speaking before civil partnerships were made legal in 2005, Michael said he hoped to marry Goss in a private ceremony 'without the whole veil and gown thing'. The public show of togetherness last night follows reports they had secretly split last Christmas. It had been claimed Goss called off the relationship after growing tired of the Careless Whisper singer's promiscuous behaviour and heavy drug use. An incident which saw the singer charged with drug possession after being arrested in public toilets on Hampstead Heath last year was cited as the last straw. However, Michael's spokesperson told the MailOnline: 'There is no truth in the matter at all. Michael is currently preparing to release his new Live In London DVD, which features behind the scenes footage of his Earl's Court concerts last year, on December 7. Home time: Michael looks sleepy as he and Goss are driven back to their Highgate home"